With my work concluding in Mumbai, it was time to head back home. The availability of so many operators on Mumbai-Bangalore route makes a tough job for a bus fan like me to choose a specific operator. Finally with lots of thinking, I made up my mind to take the 12pm SRS B9R. Checked for the tickets on my cellphone and found the bus was almost full with the last 3 rows available. My friend helped me out in taking me to the Southern Tourist office in Borivali(W). Since this was my first ever ride in a SRS B9R, I was very curious to try their service, but did the service live up to my expectation? 11:45am: After patiently waiting, the beauty turned up. This was fairly a brand new bus. The bus had done around 2.2Lac done on the Odo. The interiors were still looking fresh but what caught my eye were the blankets that were placed on every seat. No sooner the bus arrived; the crew began to load the luggage in the belly. The A/C was turned on and the blast of cool air was a respite considering the hot summer blaze outside the bus. At this moment my friend Saurabh called up and enquired my pick up point along the route. He wanted to see me off before I left. We decided to meet up at Shantaram Talav, Malad. The parcels were all loaded and we started moving. The traffic was heavy as we slowly made our way towards Dahisar. At this moment, I noticed the sensuous National’s ‘Chandni’ heading for pickup. Our next pick up point was at Shantaram Talav,Malad. The traffic was heavy however our guy decided to push the bus. We finally reached there beating the traffic along the way but our man, Saurabh was nowhere in sight. Just as the bus was about to leave he showed up and after a short meeting, the bus left. The bus slowly made its way to Sion. Here we stopped for another 25mins for parcels and for paperwork. We resumed our journey and finally the traffic towards Vashi was slowly thinning out. We reached Kalmaboli. 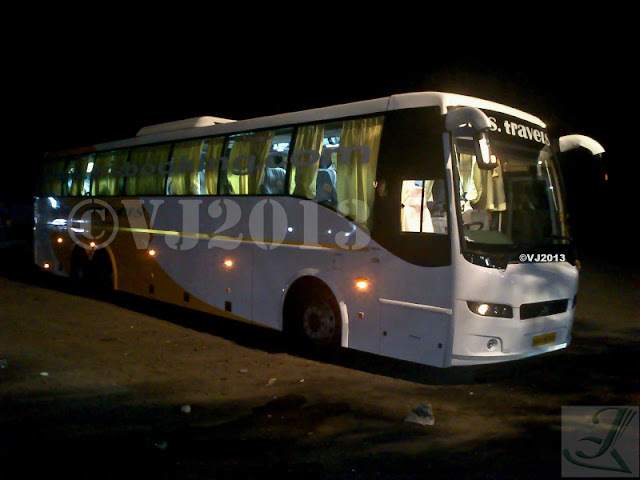 Here few Pune bound passengers boarded the bus, we crosses Panvel and finally hit the Mumbai-Pune Expressway. No sooner we hit the highway, we began to gain speed and make up for some lost time in traffic. 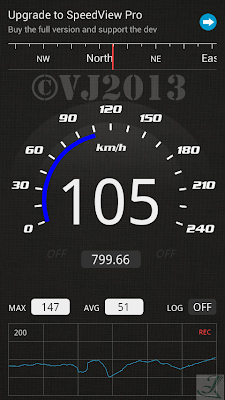 We reached top speeds upto 105Kmph. We finally pulled over at the Food Mall for lunch. Here a Purple B7R heading to Pune was already resting. We stopped for about 25mins for Lunch and during this time, National’s ‘Chandni’ joined us for lunch. We started again and made our way towards Pune. A fairly old Bollywood flick was being played to keep the passengers entertained. 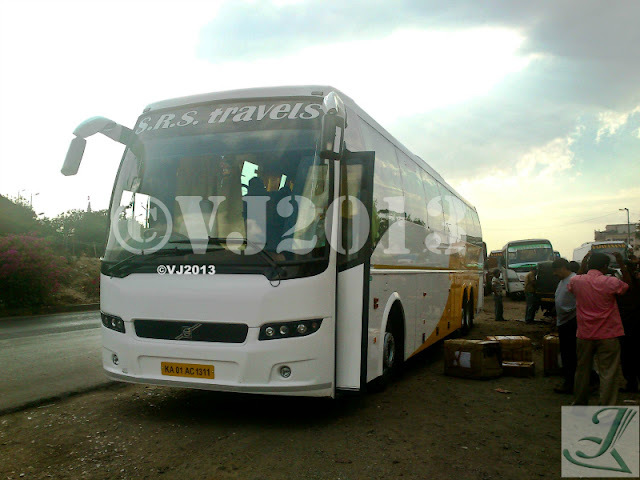 We reached Wondercity, Katraj and stopped for passengers and parcels. The stop was for about 20mins and the bus got full at this place. A couple of VRL B9R was also resting at this place. We resumed our journey and the bus was driven exceptionally well in the ghats. The power of a B9R was clearly illustrated when other vehicles were struggling to climb the steep ghat roads. Due to maintenance work going on along the stretch, the bus was driven at moderate speeds. We finally pulled over for Dinner at Hotel Navmi after Satara. Here a Surendra built Sheetal non a/c seater heading to Mangalore greeted us. At this moment National’s ‘Chandni’ overtook us. The dinner halt was for about 30mins. 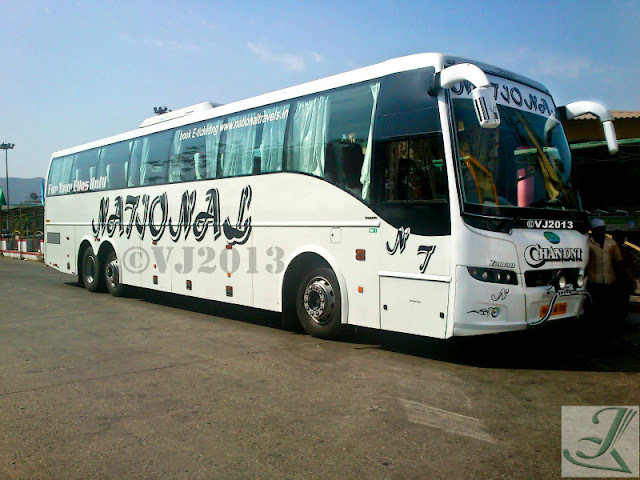 Just as we were getting ready to depart, an Airavat Club Class and Vishal B9R heading to Mangalore joined us. We resumed our journey and again the bus was driven very well along the highway. We entered Belgaum at around 22:45hrs and headed towards Hotel Ramdev, Belgaum. 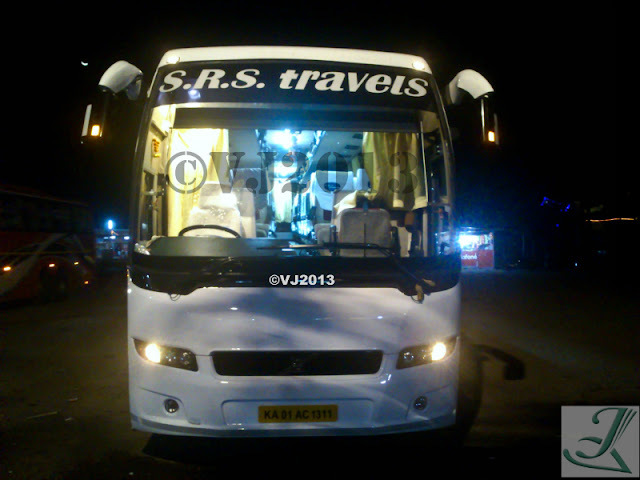 We picked up few Bangalore bound passengers here thus filling up the bus. I noticed there were few regular passengers for this bus as the passengers were seen greeting the drivers. We resumed our journey at around 23:00hrs and joined the highway. Finally I decided to get some shut eyes. I vaguely remember passing through a Toll booth near Haveri. 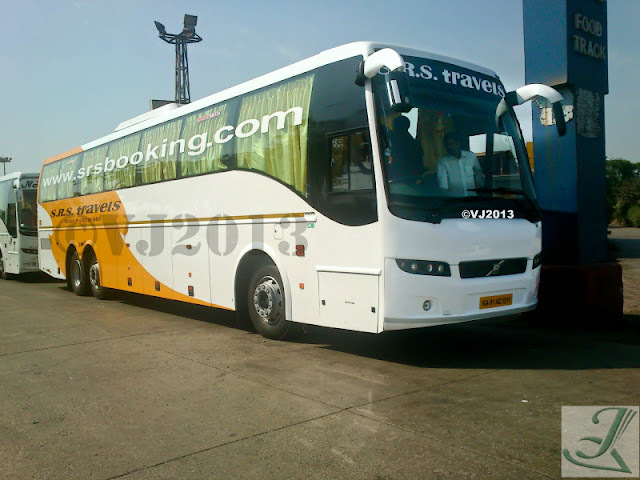 When I woke up, the bus was cruising on the Nelamangala-Yeswanthpur expressway. Since the traffic was very less, we quickly made through the busy streets of Bangalore. I requested the crew to stop the bus at Rajajinagar Entrance for which they obliged. I was dropped off at exactly 6:30am. Will I try this service again…? 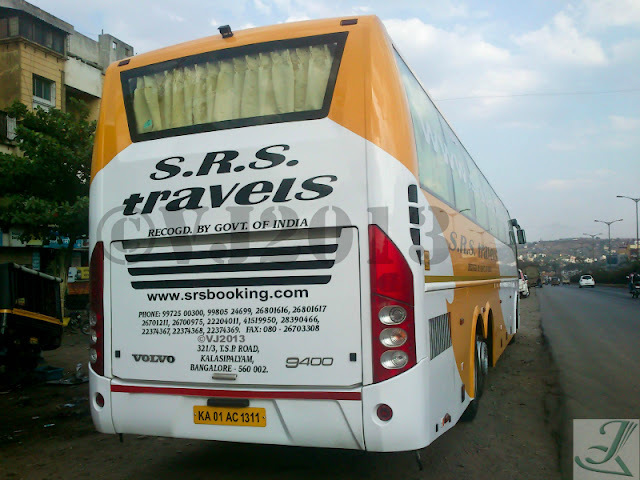 This again was one of the quickest services that I have taken from Mumbai to Bangalore. When I boarded the bus in Mumbai, I asked what time we would reach Bangalore and he was quick to reply stating we will be there by 6:30am. A promised delivered..!!! There was no difference with the driving style of the crew as they were both driving the bus in an identical manner. Use of headlights while overtaking in the night, no harsh braking, and no blocking traffic on the right lane was few observations I could make out. The cleaner was very polite and was helpful to passengers. 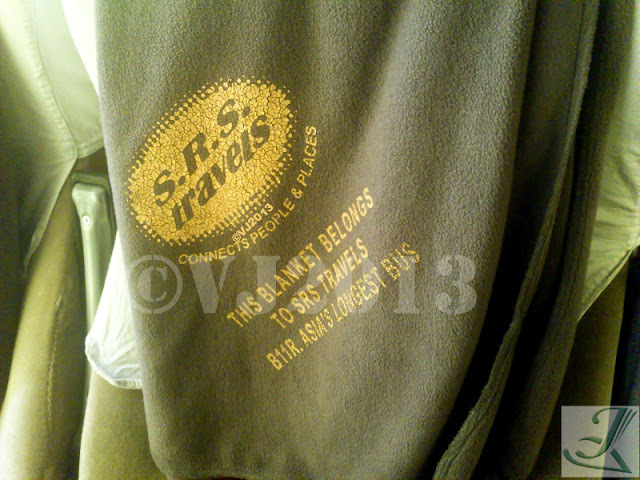 The leg space was also good when compared with other operators and the best part for which I appreciate SRS is the way they take care of their crew. The entire last row is converted into a sleeping berth for the driver. My only suggestion would be is that they provide water bottles to Bangalore bound passengers as it’s a long journey.